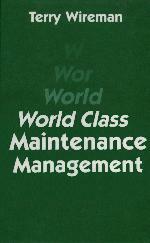 Offers an in-depth discussion of how maintenance management can control the cost of materials. Examines methods which may be used to increase productivity and reduce overtime. Explores the importance of setting up and utilizing a maintenance work order system. Covers proper methods of performance monitoring including maintenance analysis. Contains a section on implementing and improving preventive maintenance programs. Analyzing Maintenance Management. Maintenance Organizations. Maintenance Training. Maintenance Work Orders. Maintenance Planning and Scheduling. Preventive Maintenance. Maintenance Inventory and Purchasing. Management Reporting and Analysis. World Class Maintenance Management. Integration and Maintenance Management. Index.